The Blot was so thrilled yesterday when I learned Mondo had finally released Mike Mitchell’s adorable new Marvel vinyl figure, Rocket and Groot: Treehugger!!! The Blot got to see this awesome Guardians of the Galaxy figure at MondoCon last year and it’s as wonderful in person as it is in the pictures. Based on Mike Mitchell's super cute Treehugger art print from his Just Like Us series, this vinyl figure set recreates Rocket and Groot's embrace, showing that whether you're a tree or a raccoon, friendship and family is all that matters. 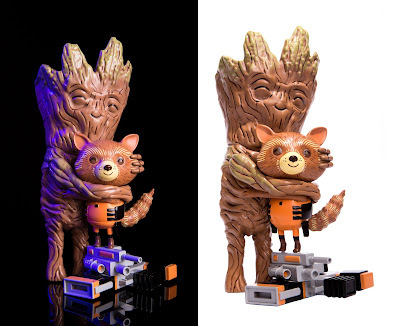 Produced by Unbox Industries, Rocket and Groot: Treehugger stands 9” tall and is made of vinyl and PVC. The Standard Edition retails for $60 and is available now at the Mondo online store. 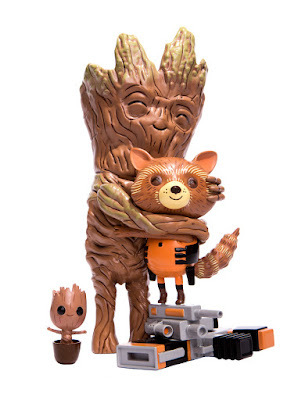 There’s also a Mondo Exclusive Edition, which includes a Baby Groot mini figure for $65. The Mondo Exclusive Edition is a timed edition only available from now through Monday, June 5th.